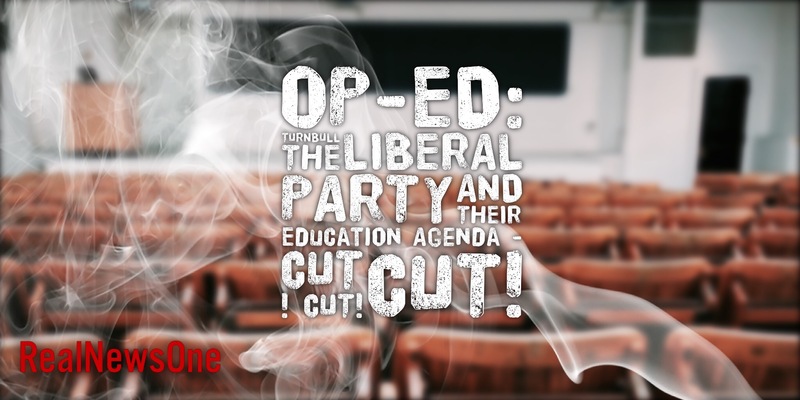 Home » Australian News » OP-ED: Turnbull, The Liberal Party And Their Education Agenda – CUT ! CUT! CUT! A few months ago Australia was given an insight into how the Turnbull Government and the Liberal party view education and their agenda on how to deal with education – they proposed cutting all federal funding from public schools. This is the tip of the iceberg. Currently with the latest test scores, international and domestic, show that the quality of education in Australia is falling and this was brought about and locked in by the Liberal party. In the 2015 budget Tony Abbott and Joe Hockey locked in about $30 billion worth of cuts. By not funding the vital Gonski reforms that Australian classrooms need, the Liberal party, with the help of National’s locked in mediocrity, inequality, and an uncertain future for Australian children which is now been recorded in the international test scores. Because of the Liberals’ $30 billion of cuts, every single Australian school is losing and disadvantaged schools are hit the hardest – this can’t be ignored anymore. These cuts have an impact in every classroom in every school across Australia – State and Independent. Over the last few years the Government and the Liberal party have ignored the states, teachers, parents, schools, students, education experts and the two education unions who have all united against these harsh cuts over the years. In the 2016 budget Australia saw, as reported by “The Conversation”, that $152.2 million was cut over four years to the Higher Education Participation Program. The program funds universities to bring in students from the lowest socio-economic levels and cut $20.9 million over the next four years to the Promotion of Excellence in Learning and Teaching in Higher Education Program. How ironic, that government is blaming universities and teachers for the fall in standards when is was the government that cut funding to programs that promote excellence in Learning and Teaching in Higher Education Program. This week Australians have once again seen that kindergartens are now in the firing line to funding cuts. This will have a major impact on families who can’t afford early years education. Once again lower socio-economic families will feel the brunt of these cuts. The cuts that the Turnbull Government and the Liberal Party are making to education will also undercut the performance of the Australian economy. Economists and research have shown that spending on education will produce greater economic growth. Professor Lisa Cameron said in a poll conducted by the Economic Society of Australia (ESA) “Future economic growth will depend to a large extent on Australia’s ability to innovate and develop high tech services and manufacturing.” the Professor went on further to say that investing in education, particularly maths and sciences, is essential in this respect and Australia’s declining educational performance jeopardises our ability to compete internationally in these sectors. The point is this, if the Turnbull and his Government continue to implement the Liberal Party’s plan of cuts to education Australia will suffer now and into the future. Education is the key to the betterment of society and empowering people, two issues that governments should be about. It is clear that the cuts to education by the Turnbull government will not produce a better society or empower people – this is not part of their agenda. Only the Liberals, who are cutting $30 billion from schools would say funding doesn’t matter. Remember the Liberals went to the 2013 election promising that it didn’t matter if you voted Liberal or you voted Labor, there would not be a dollar’s difference for your school. Australia’s school performance is falling behind. Disadvantaged kids are struggling. Extra needs based funding like Gonski is fixing this but the Turnbull Government and the Liberal don’t believe that money helps.